Measuring 20 cm in length, the GYUTOH knife is suitable for cutting and separating fish and meat. Its pointed tip and sturdy blade enable clean cuts to be made. The handle’s flat finishing ensures safety by preventing your hand from slipping from the handle onto the blade. 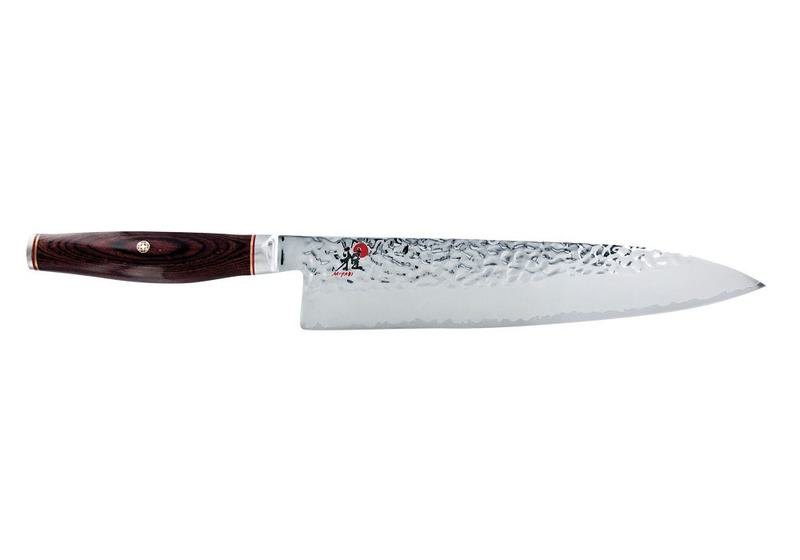 Miyabi also uses a Japanese blade profile, meaning that the GYUTOH combines high-cutting quality properties with comfort. The blade is made of a micro-carbide powder steel core wrapped in two additional layers of steel. The blade is hammer-forged, giving it an appearance slightly reminiscent of the Tschumine design. In addition, each blade of the MIYABI 600MCT series is put through different ice-hardening processes which must be completed at -196°C, so that a final hardness of around 63 Rockwell is achieved. The blade is polished on both sides and finished by hand using Honbazuke honing. The handle on the other hand is made out of pakka wood, which has a subtle pattern and stands out thanks to its sturdiness and flexibility. The perfect balance enables a high level of comfort and lets you work without tiring, thus making the knife from Miyabi a useful cutting utensil in your kitchen. CRYODUR® ice-hardened blades provide particularly good cutting edge retention, corrosion resistance and optimum blade flexibility. Authentic Japanese blade profile with Tsuchime look (hammered finish). The symmetrical blade with ultra-sharp Honbazuke edge ensures incredible sharpness. Dimensionally-stable pakka wood handle for perfect balance, outstanding comfort and fatigue-free cutting with all cutting techniques; sophisticated dark wood look.